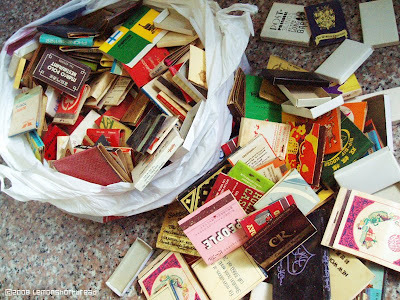 I have a bag of old and dirty matchboxes from my aunt who was clearing her house because she's moving house. There are MORE bags coming up even. Such a pity to throw them away since they are a nice collection of retro designs! They do reek of gunpowder too and are not in a very pretty state. Tho I'll be keeping a few for design references. If you're interested, do check out my lots (under supplies) I'm selling on Etsy. Perhaps you are crafty enough to use them for crafting, decoupage or altered arts? hi this is yogesh from India.a philumenist and a designer by profession.I would like to know more about these matches and their money value. Hi This is Tejas. I am intrested to purchase the whole lot of match box lables. Kindly pls could u contact me tejas_h_shah@yahoo.com or could u call me at 09892727181. Thanx.